KEH Camera is back with a Brand-a-holic coupon promotion. Good until Saturday 4/13/19 at 11:59pm ET, coupon code AB4A gets you 15% off products from 15 different brands. Excluded are “NEW” and “LN” (Like New) products. It’s the rise of the machine! The Amazon Price Bots are at it again, they have price-matched a 3rd-party seller, so currently the Ricoh GR II Big Sensor Prime is going for $569 with free shipping at Amazon by Amazon itself. Limit three per customer. Shhhh, don’t tell the grown-ups 🙂 It currently goes for $659 at B&H and Adorama. On the other hand, if you are fond of used cameras, used prices start at $479 plus shipping at Adorama. PS: the $109 used price at Adorama is a much older model with a similar name, it is a 10mp 1/1.75″ CCD camera from way back. More discounting on the Big Sensor Prime front, the new condition Ricoh GR II rawsumer is now down to the very specific price of $561.58 with free shipping at Adorama and Amazon by Amazon itself (limit up to three per customer). To the Big Sensor Primes front we go now, where the new condition Ricoh GR II is currently on sale for $600 with free shipping at B&H Photo. Orders can be placed again Wednesday night. Orders will ship on April 19+ regardless of shipment method selected, so keep that in mind. B&H also has it available in Used Condition for $500 with free shipping. Used items sold by B&H Photo come with a 90-day warranty covered by B&H. Adorama’s Veteran’s Day Sale including the Ricoh WG-M1 Action Camera for $140 with free shipping, but that’s not all! 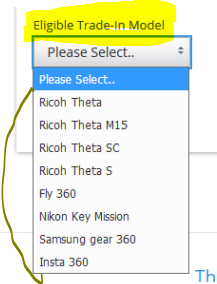 Look at the yellow “Special Offer” tab, open that, and you will see seven official Ricoh accessories. As part of this promotion, you can get TWO of them for free. Simply add the two items of interest (using the blue “Add to Bundle” button), and then press the green “Add Bundle to Cart” and proceed to checkout. The seven official accessories are various Ricoh mounts (helmet, suction, magnetic, handlebar, adhesive) and they work with multiple Ricoh WG-series cameras, so if you have other models, you can use the two free accessories on them as well. More elementproof action at the eBay Deals where the BuyDig eBay store is offering a new condition orange Ricoh WG-M1 with lots of free accessories for $129 with free shipping. You can buy as many as you like. The extras include a 32GB memory card, camera bag, card reader, HDMI cable, lens cleaning kit, and a mini tripod (those that are strong enough to hold a mosquito but only before it eats). Joking aside, this is a pretty good bundle, especially for someone who doesn’t have much in accessories (eg gift for kids, which tend to break and drop things in the water and their food). The first generation Ricoh GR big sensor prime, in new condition, is currently on sale for $500 by 3rd-party seller “Eagle Camera” with the order fulfilled by Amazon, so it is eligible for Prime shipping. I don’t know if they are an authorized dealer. In comparison, the second generation Ricoh GR II is in-stock and shipping for $626 at Amazon by Amazon itself and Adorama and B&H Photo. The new Ricoh Theta S 360-degree digital camera is now available for pre-ordering for $350 at Amazon by Amazon itself (ships in 2-5 weeks (floating estimate)) and at B&H Photo (early November estimate) and Adorama. The Ricoh GR II, with its 16mp APS-C sensor and f2.8 prime lens and no LPF is now in-stock and ready to ship to you for $700 prime dollars at B&H Photo and Adorama and various at Amazon (Amazon itself is 1-2 months away) and TheCameraBox on eBay. On the other hand, if you prefer the original Ricoh GR, it is bundled with the Ricoh GV-1 EVF and 32GB Sandisk SDHC and 4% promotional rewards for $600 at Adorama. Don’t stop believing Ricoh GR fans! Ricoh has just announced the second generation Ricoh GR, aka Ricoh GR II with a 16mp APS-C sensor, no low pass filter, 28mm f2.8 eq lens, and it is available for pre-order for $800 at B&H Photo and Adorama. The first generation model currently goes for $580 at B&H Photo (with free external GV-1 EVF and 32GB SD) and $600 at Adorama (with free GF-1 TTL Flash and 4% promotional rewards). Adorama is offering the Ricoh WG-M1 waterproof digital camera for $150 and you also get a free mount for the camera, your choice between eight different options (the blue “Add to Bundle” button). The free item value ranges from $30 to $39. The camera is available in black WG-M1 or orange WG-M1. This is a while supplies last limited time offer. Back to the eBay deals we geaux, where we find the new condition Ricoh WG-M1 elementproof digital camera for $145 with free shipping, with a limit of five per customer, offered by Adorama’s eBay store. Pentax launched a second wave of DSLR gear in 2015 [see Interesting Cameras & Lenses of 2015 reference page (no swimsuit edition I’m afraid), headlined by the new K-S2 dSLR, with a 20mp APS-C sensor shying away from the anti-aliasing status quo. The camera starts at $700 body only, goes $800 with the new 18-50mm f4-5.6 WR DC DA RE AX GI ZO ER kit lens, and $900 with the 18-50 and 55-200 lenses. Also coming along is a new weather-friendly AF-201G flash ($150), and a new WG-5 elementproof P&S camera under the Ricoh brand ($380). The K-S2 is available for pre-order at Adorama and Amazon et al at the aforementioned prices. The 18-50mm f4-5.6 lens (which is the new kit lens included with the K-S2 bundles above) goes for $300 on its own at Adorama and B&H Photo. The new AF-201G weather-friendly flash pre-orders for $150 at Adorama and B&H Photo. The new Ricoh branded WG-5 elementproof P&S pre-orders for $380 at Adorama and B&H Photo. Back to the eBay Deals where we find the new condition lime-yellow color schemed Ricoh WG-4 elementproof digital camera offered for $150 with free shipping, with a limit of five per customer, by Beach Camera’s eBay store. As of a 1/27/15 recheck, the price went up… The orange/black Ricoh WG-M1 action camera is currently on sale for $132 with free shipping at Amazon by Amazon herself with a limit of three per customer. We check upon the Monday wave at the eBay Deals where Beach Camera’s eBay store is offering the new condition elementproof Ricoh WG-20 digital camera for $130 with free shipping, with a limit of five per customer. Only the black color scheme is available through this offer, so you can’t color code it if buying for multiple people as gifts (eg gGrandchild #1 gets blue, #2 gets red, #3 gets black, #4 gets white, #5 gets orange, etc). Waterproof and elementproof cameras are one segment of the P&S camera market that has a distinct and so far unassailable competitive advantage over cameraphones, their water/element-proofness. So they continue to thrive even as some camera manufacturers dial back their P&S line-ups. Which brings us to this Ricoh WG-4 elementproof camera, offered in a loaded bundle for $190 with free shipping at BuyDig.com. It includes the standard camera kit plus these extra bonus items: floating wrist strap, extra battery, carrying case, 8GB SD, card reader, mini tripod, and the obligatory cleaning kit, microfiber cloth and of course the screen protectors. Offer ends by 1/14/15. If you are looking to make a system commitment to the Ricoh GR, Adorama has a special bundle with the standard GR kit plus the GF1 Flash plus the GV1 viewfinder plus an extra battery plus 4% promotional rewards for $677. If you are interested in the Ricoh GR and like external view finders as well, B&H Photo is offering the black Ricoh GR with a bonus GV-1 EVF included, along with a bonus 32GB SDHC card for $600 with free shipping. The free items are shown right below the camera’s name and are included automatically by B&H while the promotion is running. If you happen to want both the Ricoh GR big sensor prime and the GV-1 External EVF, you can get them together as a bundle for $600 with free shipping at B&H Photo. You also get a 32GB SDHC card… If you don’t need the GV-1, you can get the GR camera for $600 from Adorama. Big Sensor Primes are no longer four-figure luxury cameras. The Ricoh GR is now available for $600 with free shipping at Adorama when you enter coupon code GREMAILOFR over there. To test the coupon, add to cart, proceed to checkout, and look for the part of the page to enter the coupon code. You don’t have to fill up the rest of the information if you just want to test the coupon. This is part of the Adorama semi-secret BF sale.